Normally your iPhone should connect to iTunes and allow you to seamlessly transfer data. However, sometimes your iPhone might surprise you with iPhone cannot connect to iTunes errors. Follow the steps provided in this post to resolve common connectivity problems and iTunes errors. If your iPhone is unable to connect to iTunes, you might see the following error messages. Cannot connect to the iTunes Store. An unknown error has occurred. We could not complete your iTunes Store request. The iTunes Store is temporarily unavailable. Please try again later. iTunes could not connect to the iTunes Store. Make sure your network connection is active and try again. We could not complete your iTunes Store request. The network connection could not be established. There was an error in the iTunes Store. Please try again later. 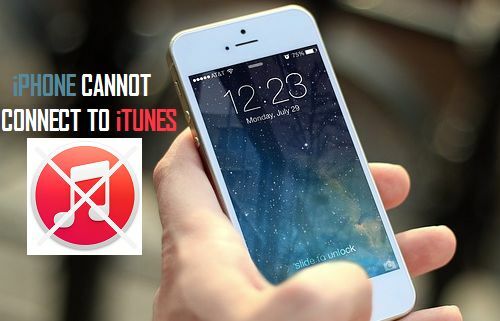 There could be various reasons as to why your iPhone or iPad is unable to connect to iTunes. We are providing below some of the solutions that have been successfully used by users and reported in forums. Take a look at some of the most common and easy fixes that have resolved this issue, we have tried to list these fixes starting with the simplest ones first, followed by more complex ones. If you are trying to use a WiFi network make sure that you are well within the range of that WiFi network and that your phone is displaying a good signal strength. In case there is no WiFi, make sure that cellular data is turned ON. Tap Settings > Cellular and make sure that cellular is turned ON. Also, you need to be aware that you may have a problem downloading larger items while using cellular network. It is better to use a good WiFi network while downloading large files from iTunes. We often tend to ignore the basic steps and instead start thinking of complex and more difficult solutions. Before jumping to other steps, make sure that you have covered these simple checks. 1. Make sure that USB cable is fully plugged in to your iPhone or iPad and into the USB port of your computer. 2. Turn off your router, leave it off for about ten seconds, and turn it back on again. A better option would be to unplug the router from its power supply and wait for 60 seconds. 3. Restart computer and try connecting back again your device to the USB ports. This simple step can reset the USB ports and help resolve the problem. It is possible that the USB port on your computer is not working. Try connecting to a different USB port and see if this helps. Did you see a pop-up message reading “Trust this Computer?” when you first connected your iPhone to the computer and did you do anything about this? Try connecting your iPhone again and Tap on the Trust button in the pop-up window. This should resolve many iTunes related problems. Make sure that the date and time settings are correct on your iPhone. It is likely that the time zone on your iPhone is the right one but you may have a different city in the same time zone set on your iPhone. Tap Settings > General > Date & Time. Make sure that your city is listed on the iPhone and not another city in the same time zone. Make sure that you are using the most recent version of iOS software on your device. Tap Settings > General > Software Update to check for updates. Many problems with iTunes on Windows 10 computers are being attributed to the incorrect version of iTunes being downloaded by users on their Windows computers. iTunes is available in 32 and 64 bit versions. You need to make sure that the right version of iTunes has been downloaded to your computer. It is likely that you may have set restrictions on your iPhone and for this reason you are unable to transfer data from iTunes. In this case you will have no problem in getting your iPhone detected by iTunes, but you will not be able to transfer any data from iTunes. In this case your computer will not be able to detect your iPhone. However, you will have no problems with other computers and they will be able to detect your iPhone normally. If you are still unable to find your iPhone on iTunes, you will need to take a look at the status of the USB driver on your computer. In Windows you need to open the Device Manager. On this screen, scroll down to look for a listing of Universal Serial Bus controllers. You should see Apple Mobile Device USB Driver listed under this area, you may need to click a plus sign to see it. If there is an, ‘x’, ‘?’ or ‘!’ you’ll need to take action. On the Device Manager screen, scroll down and until you see a listing for your Apple device. You will find this under Portable devices or under Universal Serial Bus controllers. You may need to expand the listing heading to see all devices listed under Portable Devices or the Universal Serial Bus Controllers. Follow the next steps below, in case you see an, ‘!’ or ‘?’ sign next to Apple Mobile Device USB Driver listing. Note: You need to be logged in with Administrator privileges in order to be able to update the driver. Restart the computer and once again connect your iPhone to your computer via USB cable, and see if this resolves the problem. Sometimes a simple step like rebooting your iPhone might just do the trick. However, in case nothing seems to work, you can choose to hard-reset your iPhone in order to resolve any software conflicts on your device. To Hard-reset: Press the Home and Power button till the iPhone screen goes blank. Now press the Power button till you see the Apple logo appearing on your screen.